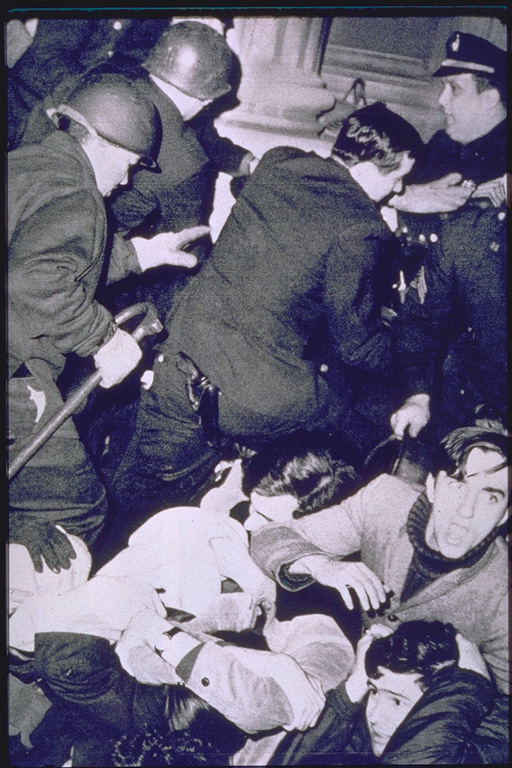 Police arresting students at Columbia, April 29, 1968. I'm pretty sure this shot is inside Low Library, in the corridor outside the President's suite. Notice the students with hands up to protect their heads. The head-bonking steps and gauntlet with the whacking flashlights awaits to the right. (Later I was told that this photo was taken on the steps of Avery Hall, but the ambience is about the same as in the Low corridor.) Photo: Life Magazine , 10 May 1968. Your excellent photograph was not taken on the steps of Avery Hall as I and a then unknown to me colleague (Russian literature) were the only two on the 3 steps leading to the chained door when the police ordered us (bull horns) to leave, which I did not do, and consequently, I was badly beaten (several cracked ribs) and carted off a waiting police ambulance and taken to Knickerbocker Hospital. When the students locked Avery, I went to a hastily called faculty meeting by Lionel Trilling -- as I recall, in the Faculty Lounge (Law School?) It was at that meeting that I and other faculty volunteered to remain on campus, at our respective buildings, to "prevent" "conservative students" from breaking into the buildings to break the strike. That is how I remember it. But I don't remember the exact date. I believe it must have been Thursday, April 24, for I stood at that door continuously, for several days, and through one weekend. This partly accounts for my exhaustion when the police finally arrived. From the Avery steps we could see the lights in the Pres office, Low.